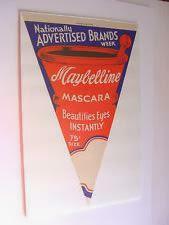 Vintage Drug Store Advertising Banner announcing Maybelline sold in it's original 75 cent box. 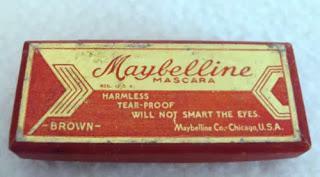 The original Maybelline box was sold only through classifieds in newspapers and magazines and wrapped in brown paper to protect a woman's reputation between 1915 and 1933. Maybelline brought a new flux of young customers into Drug Store's hoping to be discovered in Hollywood. 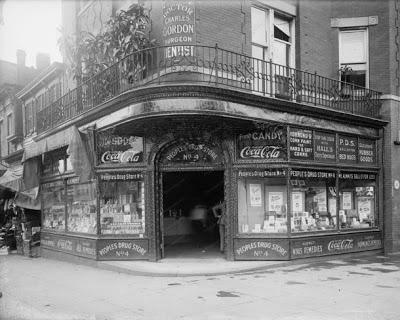 Maybelline was positioned at the front door of the drug store to encourage impulse buying. 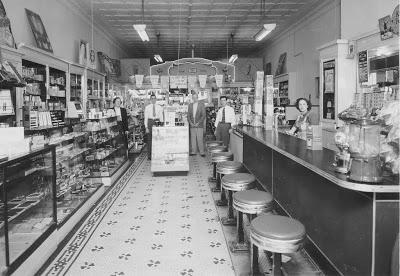 Another drug store strategy was to place a carton of Maybelline boxes on the lunch counter and near the cash register to encourage ladies to grab it before they left the store. 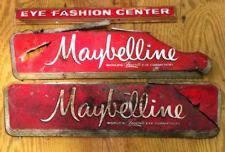 A vintage Maybelline sign found in early drug stores. 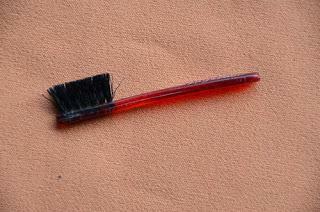 The original Maybelline brush fit perfectly in the little red box. 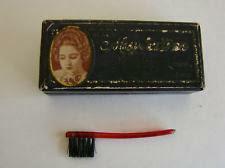 During the Depression, the price of Maybelline was dropped to 10 cents and packaged in a much smaller box than the 75 cent version. Now every woman could afford a box of maybelline and have beautiful eyes. The Maybelline Girl now on carded merchandise, was introduced in the early 1930's at the drug store. 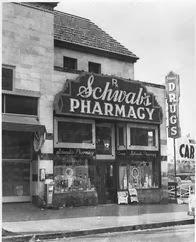 Color was added in the late 1930's. 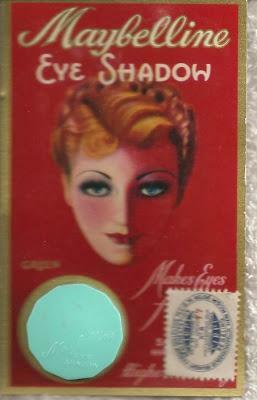 A 10 cent Depression size brass tin of Maybellne Eye Shadow, featuring the original Maybelline Girl. 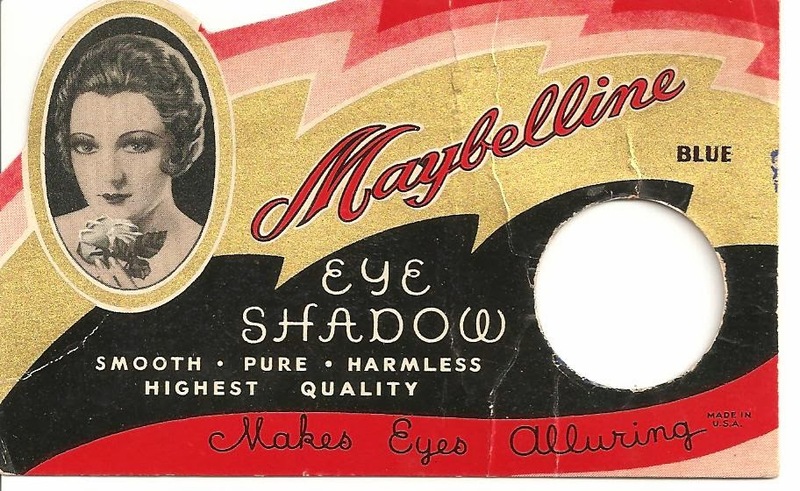 It was the beautiful advertising that brought the crowds of women into their local drug store for a box of Maybelline in 1932. 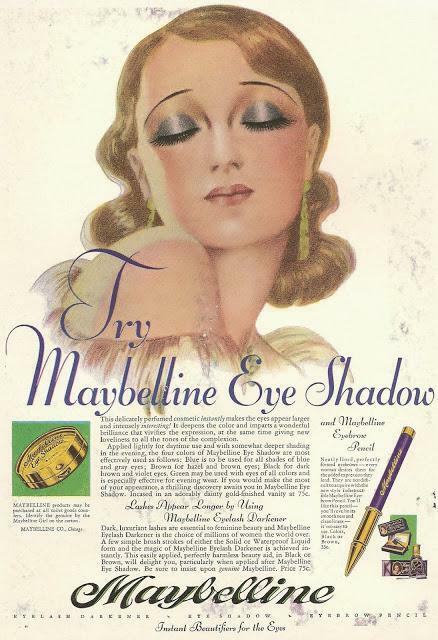 Maybellilne's Before and After Ad's were first seen in vertical advertising found in news papers and magazines in the early 1930s. The Film Cleopatra staring Claudette Colbert, inspired this before and after ad in 1934.